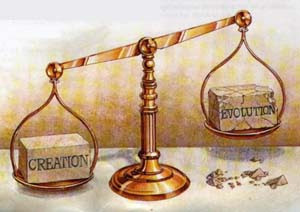 The theory of evolution has been adapted a lot since Darwin wrote his "Orgin of Species". His theory was based on very careful observations of plants and animals and fossil records. It is hard to argue with many of his statements because we can see many examples of evolution happening within our own lifetime. These changes happen in things like viruses and bacteria a lot, as we know when they mutate to become drug resistant, etc. A lot of observations from nature imply that plants and animals adapt to the surroundings they are forced to live in. For example, white polar bears are white to help them blend in to the snow and ice in their environment. African people have darker skin because over centuries it changed so they could live safely in more direct sunlight. North Europeans have blue eyes and light skin so they can absorb more sunlight and receive the Vitamin D they need to be healthy. These adaptations also apply to the plant world. Plants can even be meat eating if they grow in places with little light and need to get their nutrients from other places than the sun. No one argues with observed adaptations. No one argues with the evidence of "micro-evolution" that happens around us all the time. However, I think that Darwin's theories and those of most secular evolutionists can only explain these observations from the context of their own belief systems. Darwin was a humanist. He thought a higher power, or God, had nothing to do with the changes in the physical world--that is, if there was a God at all. I am not saying that I believe a traditional Christian view of God creating the earth in 6 days and all that kind of stuff, but that I see real gaps with some of the basic assumptions of Darwin's theories that have never been adequately proven. For example, if you say that a human originally came from a single celled organism, whether plant or animal, where did that original organism come from? Also, if nature is totally set up as survival of the fittest, why are there still weaker species still on the earth with stronger ones? Also, how can you adequately explain the level of biodiversity that exists in a single area? Natural selection would have eliminated most of it in favor of a few strong species. Also, there has never been a real discovery of the "missing link" between animal (ape) and human discovered. There have been many reports, but nothing real. I believe that your personal beliefs greatly influence how you interpret the data you see. Three people can see the same piece of news information and get three different interpretations of the same facts. I see adaptations in everything, but significant evolutionary jumps, not. I know these views are likely to spark some debate, but isn't that what this blog is about? If you want, check out the following sites to add some more fuel to the fire. This blog post is about YOUR ideas and feelings. Nobody HAS TO agree with anything. It is OK to think whatever you think as long as you respect the view of others (I know you do). Was there a creator? Is there a higher intelligence above us? Nobody knows and (probably) nobody will ever know. Trying to convince people that there is a God is the same thing as trying to convince people that there is not! There is nothing wrong with being a believer, an agnostic or atheist. I think science and religion can coexist but in a limited way...simply because religion is based on beliefs and not facts!